This pin to necklace converter will transform a pin into a pendant in seconds! Specify color: gold or silver. Specify: horizontal or vertical. Metal. Horizontal: 1/2" L x 3/4" W. Vertical: 1" L x 1/4" W.
Great invention! Pin to Necklace converter. I am not a "pin" person, but I DO wear necklaces. This nifty little thing-a-majig turns your pin into a pendant to wear as a necklace. Gold or silver color, just the right length, too. Very versatile. I have many beautiful pins and was really surprised to find that I could also wear them as a necklace. I use this product to convert pins into necklaces. It is a cleaver idea. Miles Kimball has always had a good variety of products. I can rely on a good product. Miles Kimball is the BEST!! These pin converters are just the best!! I can now wear many of my pins as a necklace ,instead of on my lapel. The price and selection of converters is phenomenal! I will tell all my friends that they're available at Miles Kimball. I grew up with Miles Kimball catalogs arriving at my childhood home. My Mom loved your catalogs, and ordered from them for many of my gifts as a child. I'm glad that Miles Kimball is still around for me to order from now!! pin converter did exactly as promised. Being able to turn favorite pins into to a necklace provides versatility to my jewelry collection. With this simple converter - any pin can be made into a pendant for a necklace .. . .
What a perfect idea to use pins that otherwise lay in a drawer - not being worn. Initially the incorrect item was sent With one quick phone call the situation was remedied at no extra cost--and quickly, too! So useful to be able to use pins into stylish necklace pieces. I use these converters to make pins and brooches into necklace pendants. Makes my jewelry more versatile! This is a great "tool" to update all those never worn pins and brouches sitting in your jewlery box into necklaces. And the best thing there is no commitment! Easy on and off! Very Unique. I have pins that I can now wear as a pendant. AND GET MANY INQUIRIES AND COMPLIMENTS. Love the pin converter! I have lots of pins that I would rather wear as necklaces and have never seen thme anywhere else! I bought the silver and the gold in each style and also gave the sets to my sister and mother-in-law. They both loved them as much as I do. Very practical and useful for new and old pins. I can't use these let as I order vertical instead of horizontal. I needed the horizontal ones. I love these for turning my grandmothers' heirloom broaches into necklaces. I have collected jewelry boxes and jewelry pieces from both grandmothers and this is the best way to wear their broaches. They complement my outfits and honor their memories at the same time. I wear pins now that I forgot I owned! It solves the problem of leaving pins on blouses that then go into the laundry. The converter also keeps the pin in sight, not covered by a scarf or the like. I sold a lot of my pins at a recent yard sale because I didn't like making holes in my jackets. Now I have an excuse to buy more! Have heard other looking for these and I always tell them where to get them. I have looked for something like this for a long time. I have many pins so can get double duty out of them now. Great idea. I like to use my favorite chain with a variety of different pendants, especially for the holidays. For some reason, I can seldom find necklaces for Halloween, Christmas, St. Patrick's Day, etc., but numberous pins. These adapters let me wear my pins as necklaces. I appreciate being able to specify gold or silver-toned adaptors, and whether they go horizontally or vertically. I ordered several. Just what I needed for all my pins. I have many pins that I no longer wear and this little converter was just what I needed to enjoy the pins again. I knew this was a perfect "just because" gift for a friend who loves all kinds of jewelry. She thanked me. I have numerous pendants and now I can wear them as a necklace. I love it. I love having the vertical adaptor. I have used horizontal adaptors before and was very happy when I found the vertical one. Thanks for coming up with this idea. I have many older lady friends and we were all looking for some way to put our broaches, pins, on a necklace. This was just the trick we needed. Works like a charm. This product is just what I needed. These 2 Pin To Necklace Converters were just what I needed. They work too. I have a lot of older ladies and they all have pins they would love to wear as necklaces, but noting we did made it work. These Converters were exactly the items needed. I like these. Got both a silver and a gold one. However I must have assumed it came with a chain. It does NOT include a chain. That's the only thing I was disappointed in the description led me to believe a chain was included. I have several Pins that are to heavy to wear on certain outfits. This item affords me the opportunity to use them as a necklace or pendant. 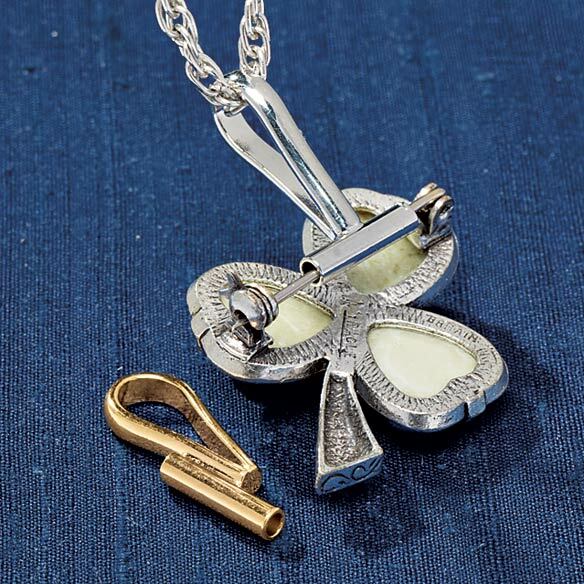 Great item to have in your jewelry box if you need to convert a pin into a necklace. Wanted to use this converter with my large Christmas pins but was too small. I now have a way of wearing all my grandmother's and mother's brooches without making holes in my garments. How great to have a little piece of them with me. I would have liked to have been able to buy a chain to match at the same time, however; especially one that can change lengths. Finally answer to convert cherished pins to lovely pendants. Works best with smaller, lighter pins. It slip along the pin, but I can add a plastic ring on it to stop that..NO problem. I love the idea of being able to add embellishments to my blah necklaces and being able to use my pins and broaches without having to put pin holes in my jackets. I do wish the loop was bigger to accommodate some of my thicker necklaces. I also love that I can order both gold and silver in the vertical and horizontal at a low price. Very CLEVER! Thanks Miles Kimball. This is a great idea for being able to wear one piece of jewelry two different ways: as a pin or as a necklace, but I would have liked it to be sold with the option to buy sturdy matching chains of varying lengths to go with the converter. These are unique items.I bought one of each color & style. They aren't sterling or gold filled but since they will be covered by a pin, will probably work as described. Haven't tried them yet. Works well on some but not all pins. converted some pins I never used into very lovely pendants. I would recommend this product. Do Not Buy the Horizontal Pin Converter. the replacement also arrived broken. The Vertical pin converter works fine. Pins hang sideways , very unsatisfactory. Did not hang good. Dissatisfied. Good idea but pin flairs and did not lay flat. Did not look good. Did not work on pins I tried. I bought both the horizontal and vertical converters. The horizontal ones just made the pin top heavy and it didn't look good at all. I bought another design from another place and the pins sit much better. The vertical converter held the pins better so I kept those but returned the horizontal ones. Seems like a good idea, but these did not work on most of my pins. Either the pin was too big for the converter bar, or it slid back and forth along the bar in an annoying way. Most pins also stuck out at an odd angle, showing the converter, which looks weird. All in all, a BIG disappointment and total waste of money. Have several pins that I do not trust to stay closed. Hoping that this will secure them so that I can wear them. I have used the horizontal converters and am please t find the vertical ones for the rest of my pins. Lots of pins I don’t wear. Two pieces of Jewelry that I really like, instead of only one. This looks like a wonderful item to convert my Grandmother's antique jewelry! To use with pins I own to place the pins on necklace chains. I have some pins that I may want to wear on a necklace. Have a lot of pins and this way I can use them ore often. This would convert my smaller pins for necklaces, multitaskers. I have several pins that i don't wear. With this converter I will wear them. I have pins that would be very nice as a necklace. I have some pins that would be good on a necklace. Will you be getting more horizontal? Have lots of pins. My fingers don't work too well these days, so can't do them. This way I can show them off again. Got a set for my sister too. I think this will a useful item. I like the free shipping. I see the good uses. TO MAKE MORE USE OF JEWELRY. Great idea I will try! Have preety pins I am not wearing as a /pin. These are a stocking stuffers for my daughter. I like to wear pin attached to necklace. It's such a great idea. It creates more versatility out of the jewelry I already own. I chose this item because I have many pins I would rather ware as necklaces. And, the price is right. For me, because I have pins that I love but would wear more as pendants. EXPERIMENT TO SEE IF SOME PINS WILL LOOK GOOD ON A CHAIN. How do I order a horizontal style? BEST ANSWER: Thank you for your question. This item is being discontinued and Horizontal is no longer available. We hope this information will be of help to you. Id like both a gold and a silver one but there is no place to tell you that so Im doing it here. Can you please tell the order pickers what I want? BEST ANSWER: Thank you for your question. You will need to order gold and silver separately. If you have placed your order already you will need to contact customer service at 1-800-296-5174. We hope this information will be of help to you.